Unveil the Strength have been unleashed upon the world with a dream team lineup, skull banging hard rock and metal hooks and possess a blazing attitude of the relentless power to succeed with their music and the fans. 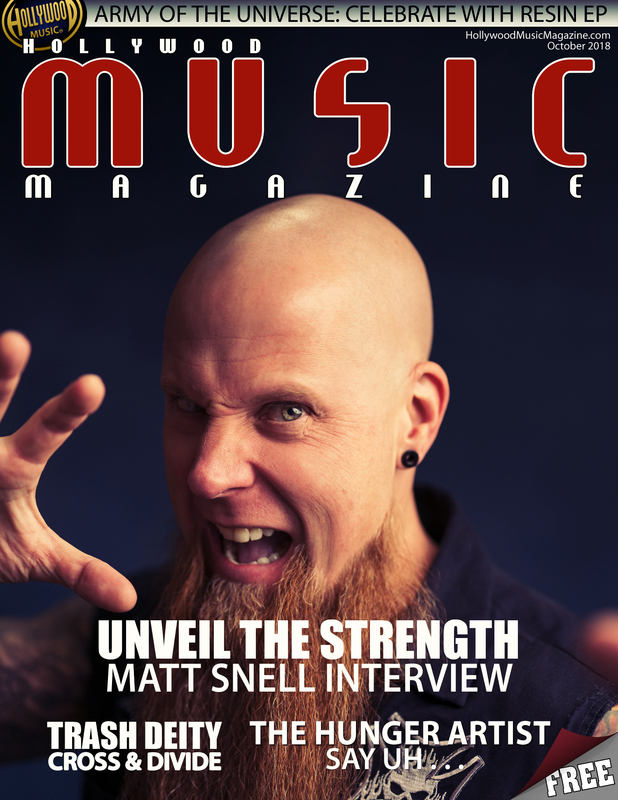 Here is our interview with Snellvis himself Unveil the Strength’s bassist Matt Snell. Let’s get started with the basics. What’s the meaning behind the name Unveil the Strength? What was the driving inspiration behind the creation of Unveil the Strength? Mark and I have been in contact for years. I was always impressed with his drive and work ethic, but more so with his vocal style and determination. Our schedules finally came together and we have been working non-stop. Did any of the members of Unveil the Strength have formal musical training? As for myself, I began around age four on piano. That led to studying Jazz on saxophone throughout high-school. Competing in solo competitions, group competitions and so on. Using the knowledge from both of these, I taught myself Bass. We all started out early and and have done private study while learning the craft. After that it’s really up to you to “further your education”. We all write, arrange and produce. I have always believed in working with, or as a team. When multiple people contribute you get a much wider range of options. It is very rare when one person can write a record completely and the result is amazing. It usually turns out to be 10 of the same songs versus a truly open, unique and interesting album. Please describe what Unveil the Strength sounds like as a whole and any specific songs you think that stand out among the rest at this point? That’s tough to answer without comparisons to other bands. We are first and foremost a metal band. What I think we are offering that sets us apart is that we come from a standpoint where the vocals have to be the strongest asset. A soulful, real vocal that seems to have gone away in light of the scream/sing pattern that is so prevalent in today’s current metal genre. Mark sings from his life experiences. A U.S. Marine veteran. He sings from his knowledge of the world as he has seen it. From the battlefield to living as a homeless Veteran for over 2 years on the streets of Southern California. He has an experienced “lived in” life that has given him a perspective that you only get through experience. Ha!, yes the “music video”. We are bouncing ideas now on several of the tunes. The caveat we are facing is which song to do first! We wrote the record and there are multiple singles and we also have to consider that, as a new band, what to put forth as our introduction to the masses. Again, a tough one. While the recording process is really a lot of fun, I would have to say that touring is it for me. I have always fed off the live shows. There are events in your life that shape you. When you find your calling there is no going back. I have been performing since I was a child and I can’t think of a better way to spend a day. I guess I don’t see it as a struggle. My wife Shannon is beyond supportive. We own a tattoo shop which has an amazing crew. They handle the business when I can’t be there. Band life is just life ya know? I’ve been in a few and between running businesses, being a teacher for years and my history of touring I have developed a solid way of dealing with “band members”. I think it’s just really important to surround yourself with people you WANT to be around who also have the ability to abandon their ego for the betterment of the team. What was Unveil the Strength’s biggest highlight of 2018? For me it was filling out the line-up. We had a great start already, then Andy and Matt G came on board and it was like… hell yeah man… this is gonna crush.. and it HAS!!! as a band? And for 2019? We are currently wrapping up production on our 1st release “Foundations”. In reality that will take us into November and with the holidays approaching we are planning to release a video or 2. The natural progression of course will be to start touring the new record which for me, can’t start soon enough! If you could only eat one thing while on tour, what would it be? Cows …. Pigs when cows are not available, but cows are quite tasty when prepared correctly. Please… and yes I know you have all heard this before, but follow our IG and FB accounts (@unveilthestrength) and keep up with us. You have the ability to engage with us this way directly.